1. Start with the sauce: heat the oil in a pan over medium heat and add the peppers. Sweat them with the red chilli, onion, tomato and garlic, cover and cook for about 20 minutes, until soften. Remove from the heat. 2. Add the tahini and, using a hand blender, blitz until smooth. Add the paprika and season with salt and freshly ground white pepper then set aside to serve with the kebabs. 4. Mix all the remaining ingredients for the kebabs in a bowl, add the cooked onion mixture from step 3, season with the ground cinnamon, salt and freshly ground black pepper, then mix well. 5. Divide into 8 portions and shape into a log around 8 pre-soaked wooden skewers. there is no pink meat, remove from the barbecue and brush with the reserved beef jus. Finish with some toasted flaked almonds and freshly chopped coriander. 7. 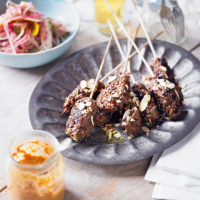 Serve these kebabs with the spicy tomato sauce and the pickled vegetables in a warm pitta.